The Scenes from Nature are the part furthest away from the dwellings and the departure of «Les Jardins du Temps». Here, the spectacle is only assured by the ornamental grasses and perennials ones. The perennials ones die out in winter to flower of more beautiful in each new spring. As for ornamental grasses, or herbaceous, their undulations give movement to the floral garden. The fitting of the plants inspired from nature is a new tendency which brilliantly finds its place with «Les Jardins du Temps». 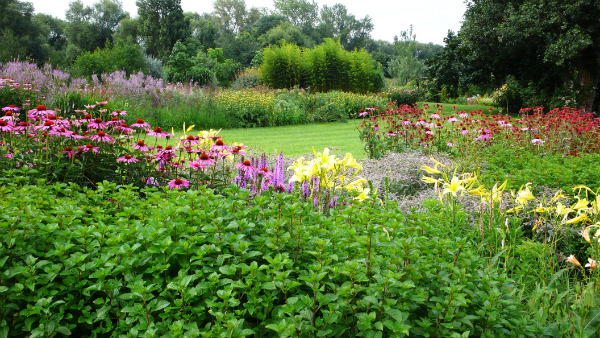 Ornamental grasses and perennials are cultivated in a more spontaneous way, less formal. This tendency of the paysagism is introduced by the German nursery gardener Karl Foerster into the years 1930. 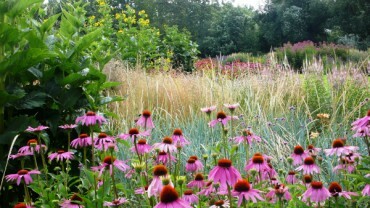 It is taken again by the contemporary landscape designers Piet Oudolf or No5el Kingsbury.